I had the incredible opportunity to join my son’s first grade class today and visit Harley Farms Goat Dairy in Pescadero, California. We’ve been before, but on this school tour we were treated to extra special privileges like entering the goat pasture and making our own cheese art. We used calendula petals, which I recognize as having many medicinal uses. Also some bright blue cornflowers. And a sweet little viola tricolor, which their website suggests may be used to treat epilepsy, asthma, and eczema. I am inspired to plant these colorful plants in our own backyard to brighten our daily salad bowl. 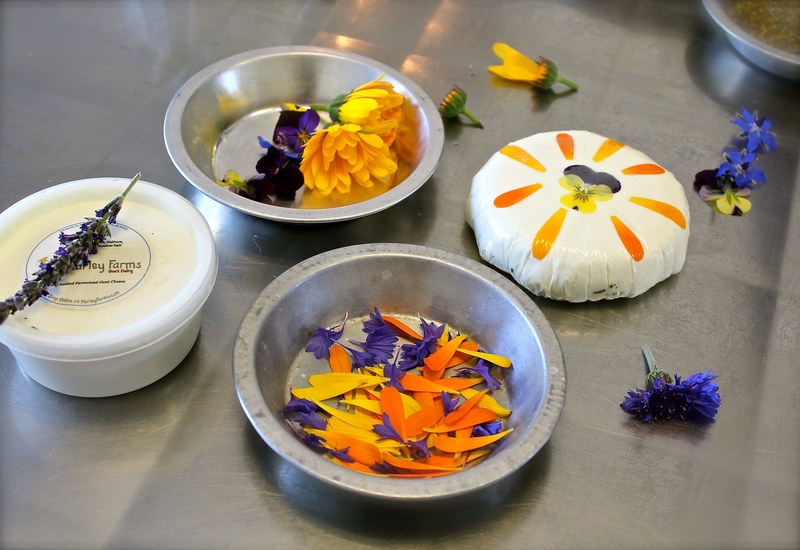 If you want to decorate your own goat cheese, lay a piece of plastic wrap over a small pie plate or dish, create a design with edible flower petals (like calendula, cornflower, and viola) and then press a hand-formed disc of fresh goat cheese on top. At Harley Farms, they add a thin layer of dried spices in the middle and place a second disc of goat cheese on top of it. To finish, fold and twist the plastic wrap in the back and press it into the shape you see above. Then just peel off the plastic to serve with some delicious bread. On day 69 of this 365 day project, I ate my daily five (including a green salad with spicy diablo dressing). Did you enjoy yours?